A few months ago; I bit the bullet and got myself a Techshop.ws membership for the Austin/RoundRock location. While not cheap; I expect to make good use of the money spent. For those that don’t know what Techshop is… in short it’s a “gym-membership” type of place which has over $500k in high tech machinery which the hobbyist can use once they’ve taken the required safety courses. Austin has a Waterjet, 2 shop bot CNC machines, mills, laser cutters, cnc sewing machines, tig/mig/welders, sand and powdercoating , etc. My first course was Shopbot CNC … Last month I completed Waterjet. This means I’m now able to use either of these machines. For the last couple of years; I’ve been wanting to do my own pinball table. Those that know me… will already know the subject matter in question. About two months ago; I settled on a plan. Create a Star Trek: Mirror Universe pinball table. The plan; Scan in a 1979 Bally Star Trek pinball table. Mirror it. And customize it for the mirror universe. 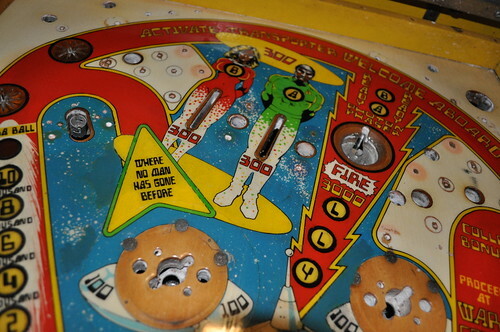 Re-colored the playfield; fixed worn areas (in computer). 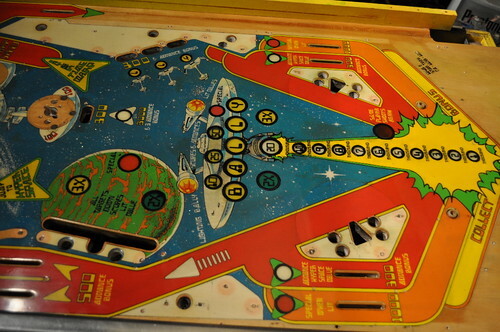 Then flipped the playfield. “vectorized” nearly all aspects of the PF. removed “reversed” text and replaced with Star Trek: series font. Transporting people become their “mirrored universe” counterparts complete with sashes and skin. “enter Hyperspace” becomes “Avert Subordinate Promotion” “by thwarting and assassination conspiracy”. Removed same player shoots again language; opting for “shoot again” text over insert. Drop Target Special becomes Terran Empire logo. colorized planet with purple glow like the re-mastered series from cbs. Not sure I like it… may go back to original look. You’ll note that I’ve removed all the switch lanes from the design. The plan is to design a set of hall effect pcbs which replicate functionality without slots in the PF. I also did the inital CAD work on getting a CNC-ready Playfield. My next step is to see if I can source some inserts from Pinball Resource. I’ll need to do this before I commit to keeping the same sized inserts as on the original. I’m curious how Kevin O’Connor would have approached a project like this. I’ve also been in touch with Kevin at www.tavco.net ; unfortunately – the printer purchased by the Austin / RoundRock Techshop is only 24in wide… and the 4mil pressure sensitive adhesive film I wanted to use only comes in 36inch widths. The only material that comes in 24inch is a non-adhesive roll; meaning I’d have to find some kind of adhesive to attach the graphics to the PF. whom may have a large format printer which can print directly to the Playfield; which should make it easier to create as I won’t have to “register” and “line up” the graphics to the inserts/table. This entry was posted in Arcade, DIY, Pinball, Star Trek: Mirror Universe Pinball, Uncategorized and tagged arcade, art, custom pinball, Mirror Universe, pinball, star trek. Bookmark the permalink.